The National Park has an extensive network of trails, including the 21 trails of the Main Network, with different lengths and difficulties. Request information at the Visitor Centres. It is advisable to see the National Park map in the corresponding link. In the Connections description, the paths that appear in brackets do not have a direct connection with the path in question but do present a relation of possible continuity. Maximum elevation: 175 m downhill. 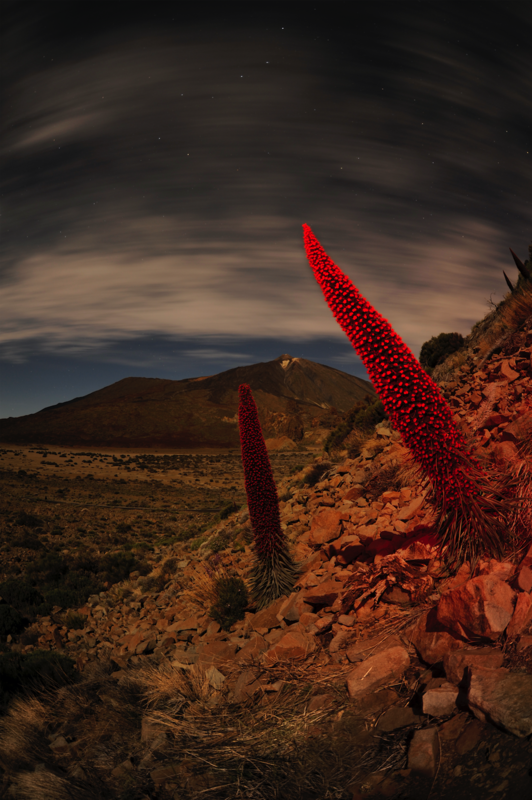 Description: It is a Footpath with small slopes and permanent views of Mount Teide. From the beginning to the Guancheros glen, we pass mounds formed by banks of pumice stone full of broom and ‘codeso’ (Adenocarpus Hispanicus) bushes. In the Guancheros glen we can also find other botanical species such as ‘rosalillo de cumbre’ (Pterocephalus lasiospermus) bush, ‘tonática’ (Nepeta teydea) and ‘hierba pajonera’ (Descurainia bourgaeana). The trail runs in its final section at the foot of the Fortaleza cliffs with the typical vegetation of escarpments. Canarian pines appear at the end of the trail..
2. Arenas Negras (Black Sands) Trail. Difficulty: Low (there is a steep slope). Description: The path climbs along the Cerrillar Mountain among abundant brooms rooted on a pumice mantle. At the top, the trail offers a spectacular panoramic view of the National Park, as well as the Maja plain. The descent runs through the caldera wall next to the Arenas Negras (Black Sands) volcanoes, lapilli cones that have scarcely been colonized by vegetation. 3. Roques de García Trail. Difficulty: Medium (there is a steep slope). Description: Attractive trail that allows you to observe different volcanic formations and a wide variety of animal and vegetable species typical of the Canary Islands’ high mountain scrubland. Los Roques are an alignment of dikes, pitons and stacks of various volcanic materials that erosion has exposed; they divide the great Las Cañadas caldera in two. The route around Los Roques (volcanic rock formations that include the following ones: Roque Cinchado, El Torrotito, El Burro, Roques Blancos, ...), in the first section it approaches Mount Teide, descending later on the most spectacular side until reaching the plain known as Llano de Ucanca. Then, it becomes quite steep until its end, after previously bordering the spectacular piton known as La Catedral (The Cathedral). 4. Siete Cañadas (Seven Glens) Trail. End: Cañada Blanca Visitor Centre. Maximum elevation: 150 m ascent. Connections: Trails 1, 2, 5, (15), 16 and Camino Real de Chasna (Chasna Royal Path). Description: Route traditionally used by the inhabitants of the island since the time of the Guanches (former settlers). It runs along the base of the Las Cañadas Caldera wall, by its eastern part. The vegetation found in its initial section stands out, with the presence of the ‘tajinaste picante’ (Echium auberianum). 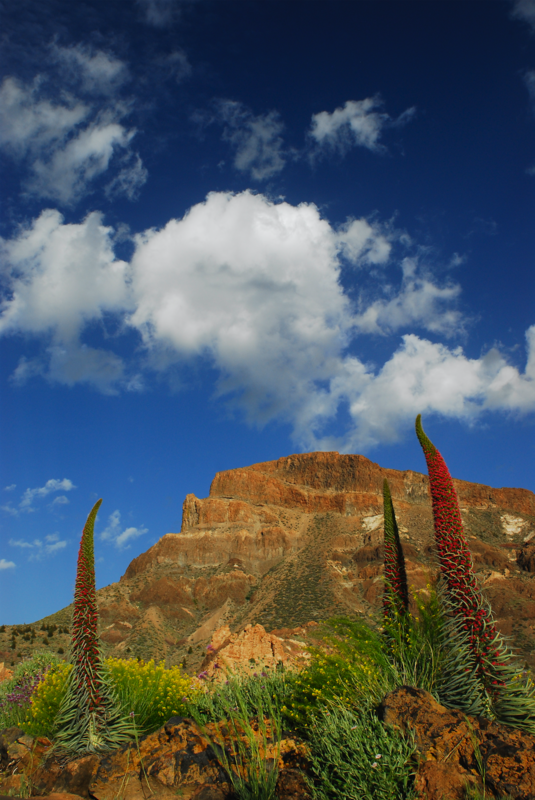 Under the Las Cañadas wall you can appreciate the geomorphological diversity of the area and the presence of the typical vegetation of escarpments, with the red tajinaste (Echium wildpretii) standing out. In the final stretch, the Capricho volcanic formation rises with shapes of great beauty. 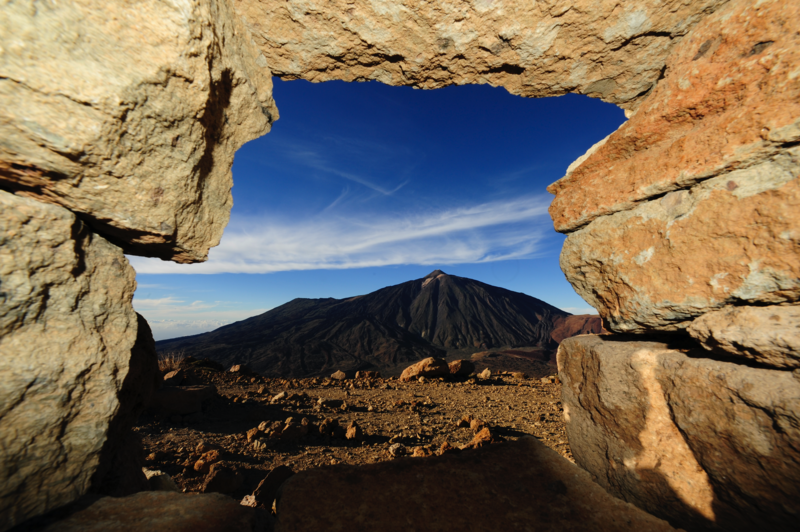 Throughout the route we find remains of pastoral refuges and we can enjoy different views of Mount Teide. This trail (4), usually departing from Cañada Blanca, and the one of Degollada de Guajara (5) are used to ascend to this summit. 5. Degollada of Guajara Trail. Beginning: Siete Cañadas Trail (nº 4). Connections: Trails 4, 8, 15 and Camino Real de Chasna (Chasna Royal Path). Description: It is part of the old road that connects the two slopes of the island, and it is known as ‘Camino de Chasna’. It ascends from the Cañada del Montón de Trigo to the Degollada gorge, between the Pasajirón and Guajara mountains. 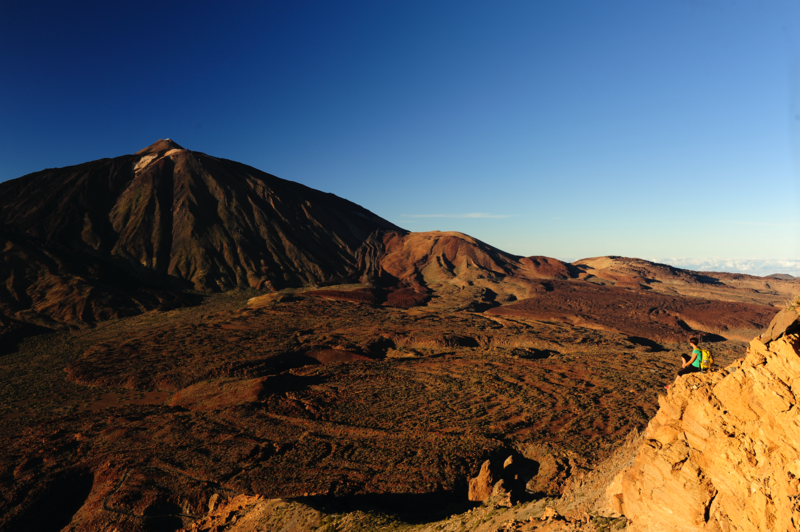 The panorama from the Degollada gorge is spectacular, with ample views of the Teide National Park and the southern slope of the island, highlighting the Río Ravine that is born here. 6. Los Tomillos (thyme bushes) Mountain Trail. Beginning: La Fortaleza trail (nº 1) (20 minutes from the beginning of the trail). End: Montaña Blanca Trail (nº 7). Maximum elevation: 470 m ascent. Connections: Trails 1 and 7. 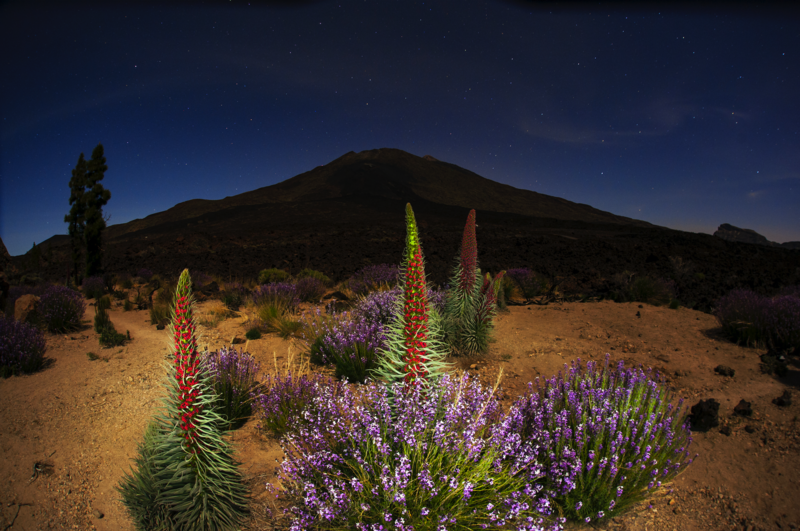 Description: Ancient road used by the first explorers and sulfur and ice collectors, in their ascents to Mount Teide. It is an easy to walk path that keeps ascending, and it has an accentuated slope once you get to Montaña Blanca. Its first section stretches out on deposits of pumice stone with vegetation composed by sticky broom and broom. In the middle area, you can see Montaña de los Tomillos (Thyme Bush Mountain), a volcanic cone that stands out in the landscape due to its dark tone. In the final section, next to the Montaña Blanca track (once again on deposits of pumice), you will notice a lack of vegetation due to the altitude and the strong winds. 7. Montaña Blanca Trail to Teide Peak. Beginning: Km 40.2 of the TF-21 road. End: La Fortaleza Viewpoint (3,537 m). Duration: 5 hours 30 minutes. Maximum elevation: 1,350 m ascent. Connections: Trails 6, (9), (10), 11 and (12). Description: Undoubtedly, this is the most walked and striking path in the National Park. Its initial section starts with the Montaña Blanca track, stretching out on pumice stone terrain. 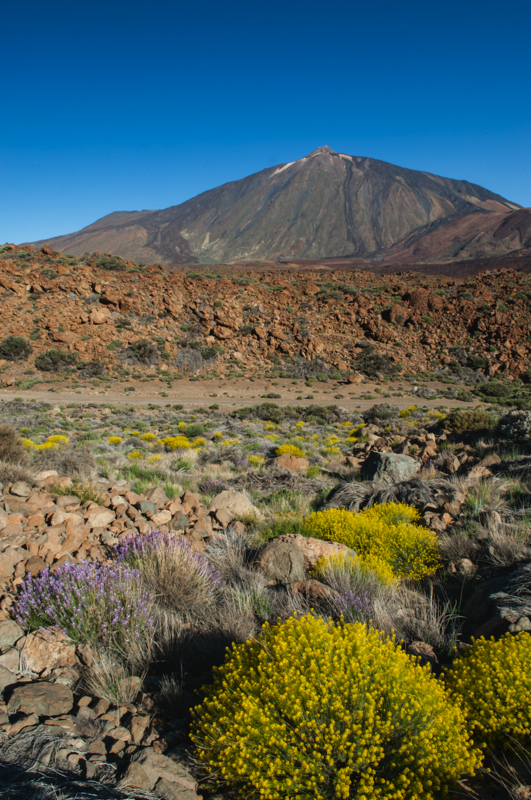 When you arrive at the foot of Mount Teide, an old path that gives access to the Peak begins, which climbs by Lomo Tieso until the Altavista Mountain Refuge with a sharp slope. The path continues rising with less of a slope, now on black lava flows that are still not colonized by vegetation. The path ends in La Rambleta, next to the La Fortaleza Viewpoint. It is only suitable for people with good physical conditions. Beginning: Km 38.5 of the TF-24 road. End: Degollada de Guajara gorge (trails 5 and 15). Duration: 9 hours 15 min. Maximum elevation: 275 m. downhill. Connections: Trails (4), 5, 15 and Camino Real de Chasna (Chasna Royal Road). Description: Most of the trail runs on an old forest track that goes by the upper parts of the caldera escarpments and crosses an excellent broom grove, overlooking the interior of the Las Cañadas caldera in several points of the route. Panoramic views of the southern slopes of the island show examples of old Canarian pines. A great geomorphological and botanical variety can be observed along the route. The trail ends, after descending from Pasajirón Mountain, at the Degollada de Guajara gorge, from where it is possible to descend to the Siete Cañadas (seven glens) trail or climb to the top of Guajara mountain. 9. Teide-Pico Viejo Trail, TF-38 road. Beginning: La Rambleta (3,500 m, Pico Viejo Viewpoint). End: Km 3.2 of the TF-38 road (Las Narices del Teide Viewpoint). Maximum elevation: 1,500 m downhill. Connections: Trails (7), (10), (11) and 12. Description: Hard road that descends on black lava. In its first section, you have spectacular views of Pico Viejo (Old Peak) crater, until you get to La Degollada de Chahorra gorge, where you can walk on pumice. 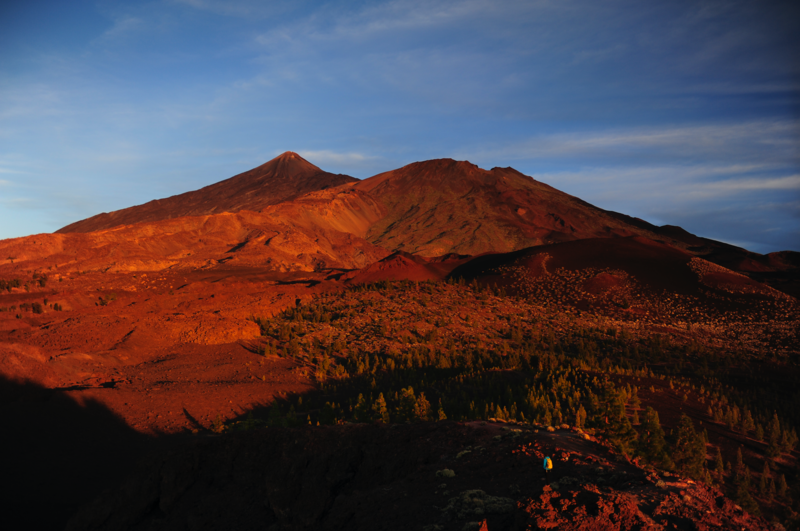 Then, you go around Pico Viejo on its south side and under the edge of its crater, descending quickly until Las Narices del Teide (Mount Teide Noses); once you walk along their border, the trail continues towards Lomo de Chío hill and from here it leads to TF-38 road. It is a path of great difficulty because it runs mainly on lava flows and very loose soils. 10. 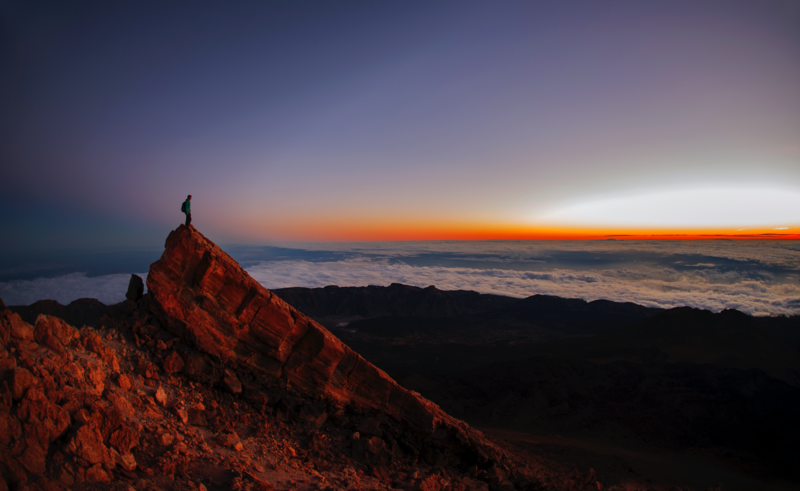 Access to the Teide Peak. Telesforo Bravo Trail. Beginning: La Rambleta (3,550 m). 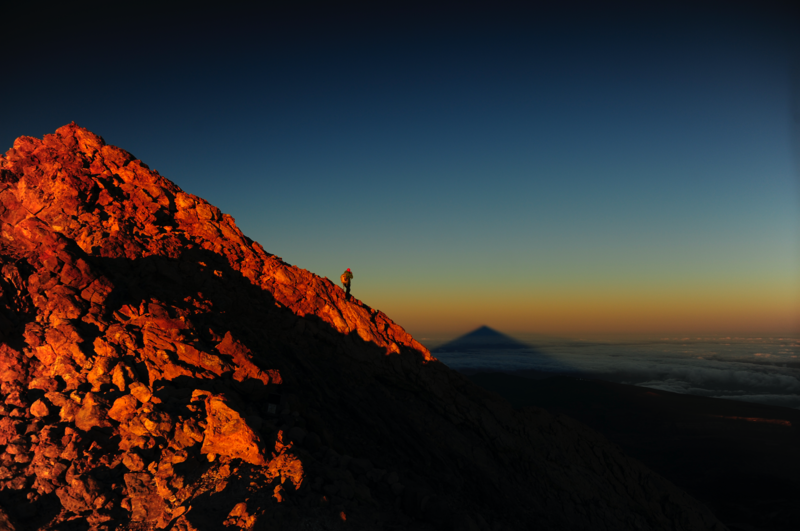 End: The Teide Peak (3,718 m). Maximum elevation: 159 m ascent. Connections: Trails (7), (9), 11 and 12. 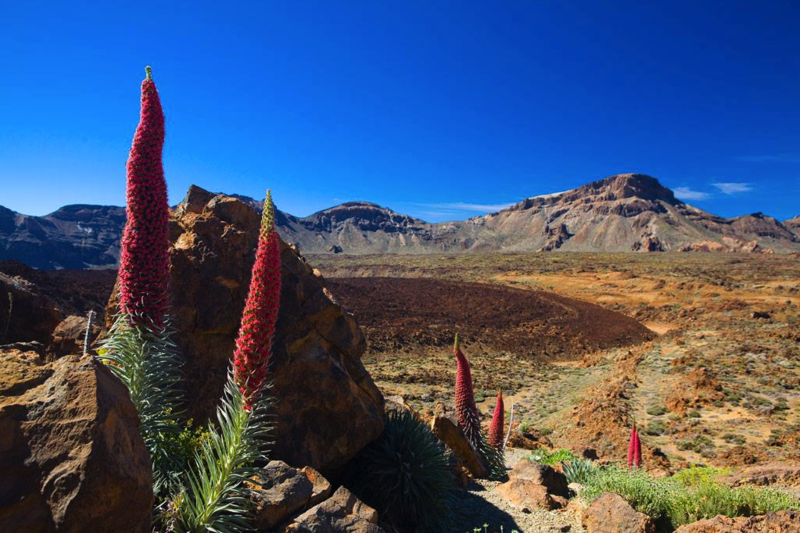 Description: Access to the Teide peak is restricted, so it is necessary to obtain a permit from the Park Management or online at www.reservasparquesnacionales.es. 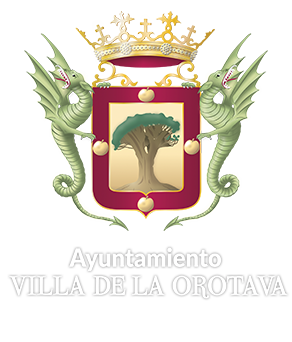 For more information, contact the Park Office at Villa de La Orotava, on number 25 Doctor Sixto Perera González street, El Mayorazgo urbanization, telephone number 922.922.371. 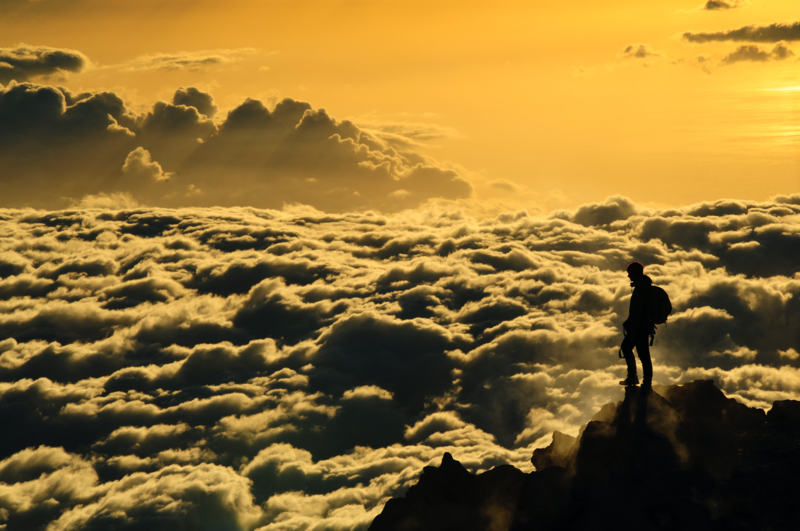 Although there is just a little slope and the path is conditioned, you must take altitude into account (the trail ends at the highest peak in Spain and in the Atlantic archipelagos) and there also are emanations of volcanic origin..
11. La Fortaleza (The Fortress) Viewpoint Trail. Connections: Trails 7, (9), 10 and 12. Description: Conditioned road that gives access to La Fortaleza Viewpoint, from where you can see the northern part of the National Park and the island. Under good weather conditions, you can contemplate an impressive view from this viewpoint. We must highlight the La Fortaleza cliffs in the foreground. 12. Pico Viejo (Old Peak) Viewpoint Trail. Connections: Trails (7), 9, 10 and 11. Description: conditioned road that leads to the viewpoint from which you can enjoy an impressive view of the Pico Viejo crater and the western sector of Tenerife. On clear days it is possible to see the islands of La Gomera, La Palma and El Hierro. Beginning: Km 7.5 of TF-38 road. End: Km 7.5 of TF-38 road. Description: At the beginning of the trail you can climb to the top of the Samara volcano, from where you can contemplate some wide and spectacular panoramic views of several volcanic cones, in addition to Teide and Pico Viejo. You can also gaze at the beautiful Canarian pine forest, effective colonizer of recent volcanic terrains. The whole route stretches out on pyroclastic flows (lapillis and volcanic slags) of dark tones. There are mild slopes that are easy to go through. 14. Alto de Guamaso Trail. Beginning: Km 42.3 of the TF-24 road. Description: A comfortable path that goes around a beautiful volcanic cone and enters its crater; In addition, it shows a magnificent view of the La Orotava Valley and the sea of ​​clouds that can cover it. It is also a good place to see the transition from the Canarian pine forest to the high mountain scrubland. Among the volcanic materials that formed the cone, the volcanic bombs accumulated on its slopes stand out. 15. Guajara mountain top Trail. Connections: Trails (4), 5 and 8. Description: High mountain terrain trail that ascends from the Degollada de Guajara gorge to the mountain top, known as El Alto de Guajara, from where you can see the best panoramic views of the Teide, Pico Viejo and Montaña Blanca volcanoes, as well as a wide overview of the Las Cañadas Caldera. A spectacular watchtower from where you can distinguish the different lava flows and the plains known as cañadas. The south slope of the island is visible throughout the ascent. On clear days, you can also contemplate the rest of the islands of the Canary Archipelago on the horizon. Beginning: Km 43.3 of the TF-21 road. End: Siete Cañadas (Seven Glens) Trail (nº 4). Connections: Trails 4 and 19. Description: Comfortable path that runs through an old track, next to which beehives are placed in spring in order to obtain the appreciated broom flower honey. 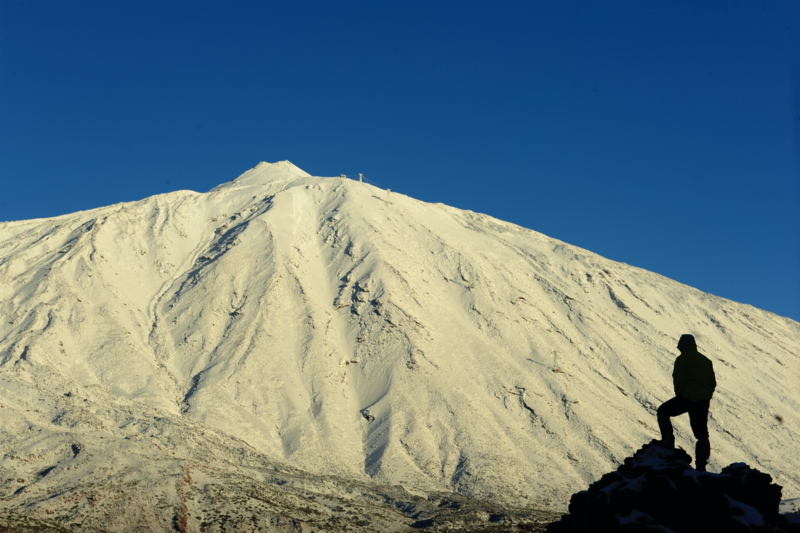 The trail begins at the foot of the Mount Teide slopes and, as it moves away from it, Mount Teide becomes more and more visible in all its spectacular presence. The Montaña Blanca dome lavas, with their different shapes, stand out. The path ends in the Siete Cañadas trail, at the foot of the Guajara cliffs. Beginning: Km 33.3 of the TF-24 road. End: La Crucita (km 30 of the TF-24 road). Description: A path that runs along the top of La Esperanza Mountain Range, where you can see the two great valleys of La Orotava and Güímar, sometimes covered by the sea of ​​clouds. Along this trail you can see some large volcanic bombs and some of the botanical endemisms of this area, sharing the territory with other characteristic scrubs of the National Park. Canarian pines can also be observed, especially at the end of the trail, in La Crucita, where the most used path between the two valleys (and in the Virgen de Candelaria pilgrimage) is to be found. Beginning: Boca Tauce crossroads (road junction TF-21 and TF-38). End: Km 3 of the TF-38 road. Description: It is an easy to walk and almost flat path that runs through the most western part of Las Cañadas, where the eroded shapes of the wall escarpments, the black lavas of the eruption of 1798 (Narices del Teide) and the beautiful twisted lava formations, provide the itinerary with a variety of sensations to which the silhouette of the Teide and Pico Viejo giants must be added. End: Las Cañadas Parador (Government run hotel). Description: It is a path that descends comfortably from the foot of the Teide slopes to the Parador (Government run hotel), located in the middle of the spot known as Cañada Blanca. At the beginning, the path skirts the Majúa Mountain pumice cone, to later border its lavas and then cross the Cañada Blanca broom grove. Beginning: Corral del Niño (Km 38 of the TF-21 road). End: Izaña crossroads (Km 37.5 of the TF-21 road). Description: This walk allows you to approach ancient volcanic cones that present beautiful and varied colorations and later skirt the volcanic cones formed in the January 1705 eruption of the Fasnia Volcano, with its intense black colour. The dense brooms of the zone are used by the beekeepers who take advantage of their intense flowering to obtain the appreciated broom flower honey, contributing to the pollination of the botanical species that live in this area. 21. Trail from El corral del Niño to Mal Abrigo. End: Mal Abrigo (Km 34.8 of the TF-21 road). 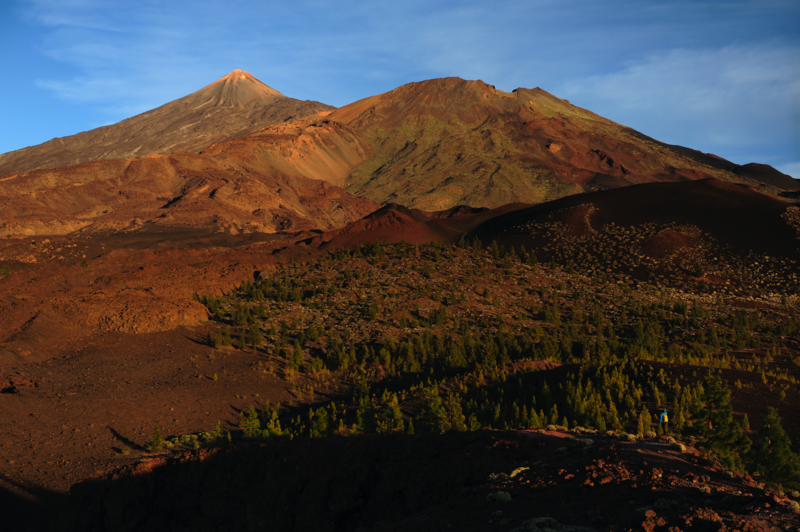 Description: Most of the trail runs along a forest track from which you can easily see a group of volcanic cones and, in the distance, the silhouette of Mount Teide. You can also see the island of La Palma in the horizon. The final part goes up zigzagging and crossing a dense broom grove, that reaches the TF-24 road, in front of a volcanic rock formation known as Mal Abrigo.